Heritage members made quite an impact in 2016. Scroll down to see the key milestones you achieved each month . Your support launches a major effort to set the agenda in a critical, high-stakes election year. Heritage briefs presidential candidates and publishes written guidance—in the form of a new Mandate for Leadership—to will prepare the next administration to govern according to constitutional principles. Heritage continues to brief presidential candidates at their request, steering them toward a major policy guidebook for Congress, Solutions 2016, and toward Heritage’s economic, cultural, and military indexes. These publications eventually wind up in the hands of the Trump transition team. For the first time, a bill to repeal Obamacare (and defund Planned Parenthood for a year) reaches President Obama’s desk—a move you’ve hoped for since the law was passed in 2010. The bill, which was vetoed by the president as expected, sets the stage for our next move: filibuster proof repeal bill in early 2017. 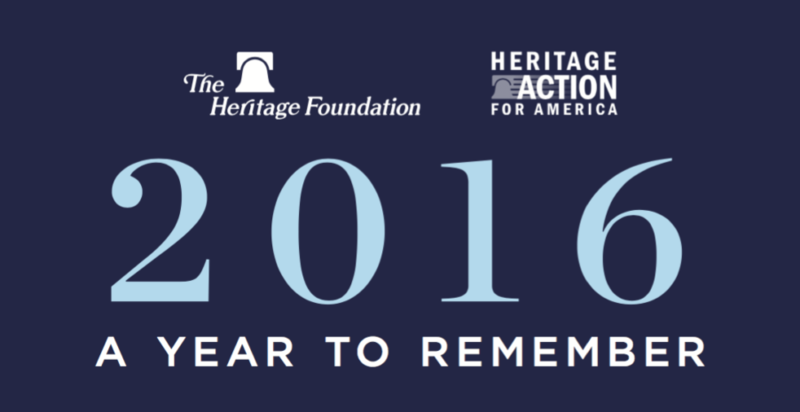 As the nation absorbs the shock of Justice Antonin Scalia’s sudden passing, Heritage Action launches its “No Hearings. No Votes.” Campaign. In this way, you keep Congress from considering Judge Merrick Garland for the Supreme Court, makes the Court a defining issue in the elections, and saves Scalia’s seat for an appointment by President-elect Trump. with 1.9 million Facebook fans, 544,000 Twitter followers, 22,333 YouTube subscribers, and a popular multimedia news website, The Daily Signal. To prepare for the tough legislative battles ahead, Heritage launches its Weyrich and Feulner Fellows programs in which Heritage experts train House and Senate staff to be as adept at congressional rules and procedures as politicians on the left. The House introduces a Heritage-inspired bill, the Separation of Powers Act, which would force federal courts to exercise their own judgment in construing ambiguous statutes and regulations, rather than deferring to the federal agencies. The bill goes on to pass the House three months later and, though it stalled in the Senate, it will likely be reintroduced in 2017. After Heritage Action for America (and its elite activists, called “Sentinels”) present to conservative lawmakers The Heritage Foundation’s Blueprint for Balance: A Federal Budget for 2017, the bloated Boehner-Obama budget arrives dead on the House floor. Heritage publishes Blueprint for Transition, a detailed guide and timeline for transferring executive branch power between Election Day and Inauguration Day, and makes it available to the presidential candidates. The blueprint winds up in the hands of Trump’s transition team. Heritage publishes a list of potential Supreme Court nominees from which Donald Trump eventually borrows six names. North Carolina and Mississippi pass religious freedom legislation based on Heritage Foundation templates, while Heritage Action drums up support in Congress for similar legislation at the federal level to protect those who refuse to go along with the political left’s “redefinition” of marriage and gender. After a well-timed op-ed from The Heritage Foundation and pressure from Heritage Action, the House strips an amendment in the National Defense Authorization Act that would have included young women in future military drafts. This gives Americans an extreme view of, and hope of stopping, the political left’s radical remaking of gender roles. In a rebuke of the Obama administration’s overreach, the Supreme Court bars the IRS from imposing millions of dollars in fines on the Catholic charity Little Sisters of the Poor, and orders the government to leave religious organizations alone. All the while, Americans hear sound arguments from Heritage in favor of religious liberty. Sens. Mike Lee, R-UT, and Tom Cotton, R-AR, draw on Heritage research and analysis to introduce the United Kingdom Trade Continuity Act, which would maintain all current U.S. trade agreements with Britain. After the ISIS-inspired massacre at Orlando’s Pulse night club, your support helps Heritage and Heritage Action stop Democrats in Congress and President Obama from passing legislation—meant to distract from their unwillingness to stop Islamist terrorism—that would infringe on Americans’ 2nd Amendment rights and right to due process. The 2016 GOP Platform is released containing numerous policy positions consistent with Heritage recommendations, including the repeal and replacement of Obamacare, America’s withdrawal from specious climate treaties, and the affirmation of U.S. defense treaty assurances to Taiwan. News hits that former Heritage President Ed Feulner has been chosen for a major role on Trump’s transition team—along with eight other current and former Heritage staff members, including former Attorney General Ed Meese, Heritage Board Member Kay Coles James; and Vice President of Heritage’s Kathryn and Shelby Cullom Davis Institute for National Security and Foreign Policy Dr. Jim Carafano. In a speech in Detroit, Trump cites Heritage research on the impact of major government regulations imposed by the Obama administration on U.S. citizens: By 2030, Obama-Clinton energy restrictions will eliminate half a million manufacturing jobs and reduce economic output by $2.5 trillion. While much of Heritage focuses on preparing for a potential Trump transition, Heritage’s Asia policy experts keep their eye on the safety of America and our Asian allies by toughening up a sanctions bill—signed into law by Obama—that will actually put pressure on North Korea to stop its nuclear provocations and human rights abuses. In a press release on Sept. 9, then-candidate Donald Trump cites two key proposals from Heritage’s 2016 Index of U.S. Military Strength as part of his formal policy platform: building a Marine Corps with 36 battalions and an Air Force with 1,200 fighter aircraft. Heritage Action crosses the 16,000 Sentinel-recruitment mark—creating a larger-than-ever network of elite conservative activists that is now poised and ready to hold a new Congress accountable in either presidential election outcome. Donald Trump and running mate Gov. Mike Pence win the presidential election of 2016. Just a week after Trump’s victory, stragglers in Congress—still not grasping the anti-cronyism mandate just laid down by the American people—try to pass a proposal to bring back earmarks for pet projects, and are promptly defeated by Heritage Action thanks to you. With pressure from Heritage Action and research from The Heritage Foundation, conservatives in Congress unite around a filibuster-proof proposal for repealing Obamacare that will hit President Donald Trump’s desk right after inauguration. In his keynote speech at Heritage’s annual President’s Club Meeting on Dec. 6, Vice President-elect Mike Pence tells the crowd that the Trump administration “ … will continue to draw from the deep intellectual resources of The Heritage Foundation,” and vows to repeal Obamacare, pull back regulations, rebuild the military, and seal the U.S. border with Mexico. Heritage’s Preston A. Wells Fellow in Health Policy, Nina Owcharenko, becomes the latest of numerous Heritage staff to be picked by the Trump transition team to serve on “landing teams.” These teams help execute the policy and staff changes needed in specific departments during the transition. Other landing team members from Heritage include: economist and regulatory expert David Burton, national security expert James Carafano, tax and economic policy expert Curtis Dubay, foreign policy expert Steven Groves, national defense analyst Justin Johnson, Heritage Trustee William Walton, and defense policy expert Dakota Wood. You enable The Heritage Foundation to release a plan to lead America’s resurgence in 2017—capitalizing on this historic moment in order to heal our culture and our economy, restore the rule of law, and restore America’s standing in the world. Heritage’s plan is tough and focused: unbending in its efforts to change Washington, guide the new administration, and achieve conservative policy victories. This work would not be possible without the support of our members. Thank you. Wow!!! I really enjoyed reading this summary and it made me feel good that I donate to The Heritage Foundation. Let’s hope the next four years will be strong for our country. I am discouraged about the enormous funding that groups from the radical left receive (George Soros!) and all those groups must be fought! Thank you Heritage Foundation!! Very Good work. I approve. Keep up the good work and continue your educational efforts to show how conservative ideas can help the United States to recover and prosper. This is an outstanding list of accomplishments. It’s comforting to know that the new administration is looking to the Heritage Foundation to help our country find its way out of the progressive darkness. Thank you very much! I’m proud to support you, keep up the good work. Less government gets my vote! Thank you Heritage, your work is absolutely vital. As Ronald Regan said “we are only one generation away from losing our freedom”. Thank you for your dedicated, thoroughly researched work to bring much-needed reform within our government. Our new president needs all the guidance he can get in following through on making his promise to heal this nation. I am, also, a supporter Judicial Watch and the ACLJ. This is both marvelously impressive and so very good for our country! It is certainly reason to have great confidence as our nation moves forward and out of the Obama dark ages.